The 48th Biel Chess Festival has ended, the main event of which had six GMs. Before the last round, the table was topped by Maxime Vachier-Lagrave and Radoslaw Wojtaszek, both of whom had White today. As expected, the French GM won fairly easily against Richard Rapport, who had a nightmare tournament. After losing his last five games in a row, Rapport has dropped out of the world top 100 on the rating list. Vachier-Lagrave, on the other hand, had to await the outcome of his rival's game. Under the rules, if the two tied for first, there would be a playoff, although a separate day had been set aside for this. White is completely winning. The simplest line is 30.Rdxb2, the most precise 30.d7. 30.Rf1? The first step towards the precipice.This move does not throw away the win, but as becomes clear, there is a reason why the first alarm bell rings. It appears the Polish GM simply ran out of energy at the finish. 30...Rxc5 31.d7 Bf6 32.Rxb2?! It is hard to explain why Radek did not promote the pawn: 32.d8Q+ Bxd8 33.Rxd8+, and this is still a winning position. Black cannot hold an exchange down, with such a knight. 32...Rg5 33.Qb8+ Kg7 34.g3? (Correct is 34.Qb7) 34...Qd4 35.Rb4?! There is no reason to give up the pawn. Better is 35.Rb7!, after which the game could have continued 35...h5! (Possibly Radek did not see that his queen covers g3) 36.Rc1!? h4 37.Rb4 Qd2 38.Qf4 Qxd7 39.Qxh4 Rc5 40.Rxc5 Bxh4 41.Rxh4. It is not easy to win, but this would certainly have been better than what happens in the game. 35...Qxd7 (A sad end for the strongest pawn) 36.h4 Rf5 37.Rbb1 Qd2 38.Rbd1 Qxa2 39.Qxa7 Qc4 40.Qe3 a5 41.Qd3 This move also deserves a question mark, but Wojtaszek was clearly in no state to continue fighting for the win. Vachier-Lagrave's remarkable finishing run (consecutive wins over Adams, Navara and Rapport) allowed him to win the event for the third year running. Counting his win in 2009, it is his fourth victory overall, which is a record in the history of the tournament! Karpov and Morozevich have both won the Biel tournament three times, although it should be noted that the event has had different formats at different times. But there is no doubt that the modern history of the Biel tournament is associated with the name of Maxime Vachier-Lagrave, just as, say, Dortmund is associated with Vladimir Kramnik. In Biel, the main event is nearing its climax, with six players involved. The winner for the past two years, Maxime Vachier-Lagrave, was a few days ago on a modest 50%, but as the finish approaches, he is on a roll: yesterday he beat Michael Adams and today he downed David Navara. David Navara had to start the Biel tournament with two successive blacks, and he is the only player yet to draw a game. Whereas yesterday he failed to hold a spectacular endgame against Adams, today he confidently outplayed Pavel Eljanov. In round five of the Biel tournament, all three games were drawn. Thus, David Navara ends the first cycle as sole leader. Today, he drew confidently as Black with Maxime Vachier-Lagrave. But Pavel Eljanov could have won his second game in a row. The main tournament in Biel, in which more than 50% of the games so far were decisive, is approaching its finish. There are two rounds to go, yet the fate of the first prize is not obvious at all. 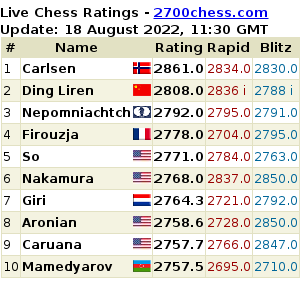 Radoslaw Wojtaszek and David Navara are in the lead with 5 points each; Maxime Vachier-Lagrave, who is half a point behind, is in turn followed by Michael Adams with 4 points. Pavel Eljanov has 3.5 points. 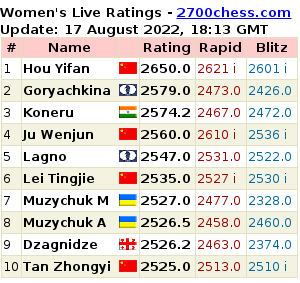 Moreover, the leaders will face each other in the last round. In Biel, round one of the main event has been played. All three games featured real fights: Vachier-Lagrave - Eljanov and Wojtaszek-Rapport did not produce winners, but David Navara did not manage to hold a difficult defence in his game against Michael Adams. The 48th Biel festival will run from 18-31 July this year. As part of it, from 20-30th there will be a Grandmaster tournament, the line-up for which will, for the second time in the festival's history, be category 20. What Was This King-March All About?